Whew! We have had a busy week around here. It seems everything happened at once! We’ve been waiting a long time for some “kinda necessary” things to get fixed, and muddling along without them, and all of a sudden, it’s like Construction Central around here. The most important project to me was getting my kitchen sink fixed. 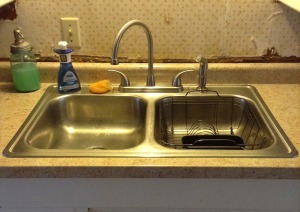 When we moved in, the left side of the sink would not drain. Nothing we tried fixed it. OK, I’ll live with it — the right side still drains. And we want to replace it all, including the countertop, anyway. We’ll just do it all at once. Then the hot water line underneath started leaking. So we had to shut the hot water off. Then the shut-off valve started leaking. So OK, now I have no hot water in the kitchen, and I have to keep a bucket and some towels underneath to catch the drips and check them all the time. Time to call a plumber. He came by and looked at it, said he’d be back the next day, and never showed back up again. Wouldn’t return phone calls. OK, I understand — he took one look at this “Money Pit” and decided he wanted no part of it. We’ll have to find someone else. Meanwhile, I have to live with it like it is. And then the right side of the sink stopped draining . . .
Called another handy man to come fix it. He came and looked it all over — said he’d be back in 2 weeks. That was in July . . . we’ve never seen him again. Evidently, he, too, wants nothing to do with this place! It’s now November. I’ve spent nearly a year bailing my sink out with a pan or a bucket by hand, and hauling hot water back to the kitchen from the bathroom to do dishes. It’s just become routine, but it’s also highly discouraging. This house has so many projects that need done, but the disaster that is my kitchen has just gotten downright depressing. While I was at Sew Sweet Quilt Shop last weekend for the retreat, I wandered over into the quilt shop and a gal was in there showing some quilts she had made. Being such a sucker for show and tell of any kind, I nosed in to look. And Jeanette introduced me to the quilt maker, and we struck up a conversation. Said conversation turned to “house projects”, and I mentioned that ours was a complete disaster about to reach epic proportions because of my inability to find a handy man who didn’t take one look at the place and run away screaming. I called him on Monday. He showed up on Tuesday. He came back on Wednesday. But I now have a new kitchen countertop, new faucet, and all new plumbing. Do you know that I can now stand at my kitchen sink, have hot and cold water running, AND the sink will actually drain? Can you imagine? This will take some getting used to! My very next thing is putting up the new backsplash so this area doesn’t look quite so nasty. And now I can finish painting the cabinets and put the doors back on with their new hardware, and unpack my dishes. Do you know how nice it will be to finally not be living out of boxes any more? It’s been way too long . 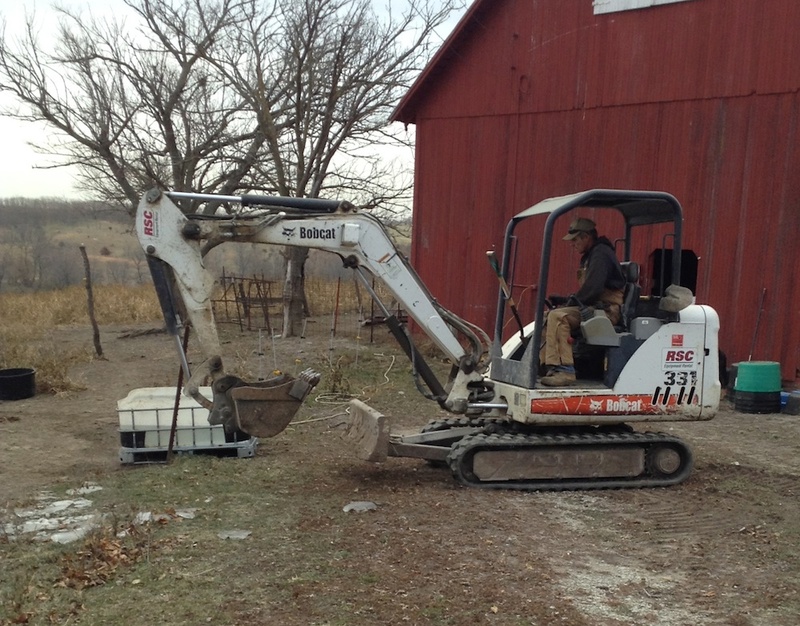 . .
Calvin has done countless other little odd jobs around here that My Cowboy and I just could not do ourselves. And he says he’ll keep coming back! I think I love him. And . . . it gets even better . 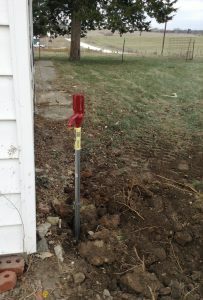 . .
We have two outdoor spigots we use to water the livestock. They both leak, and one of them completely quit working. 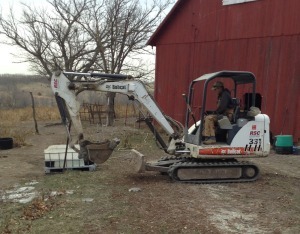 The plumber showed up today to replace the spigots! Now we won’t have to wrestle 300 feet of garden hose, or break ice, or pour hot water on the pumps, or drag 5-gallon buckets around all winter just to do chores. This is very good news, especially for My Cowboy, and I happen to like it, too. There is still a list of projects as long as my arm that need doing around here. But I’m so happy we got a few projects checked off the list this week, I could just squeal — and I probably need to bake Calvin some cookies! Here’s a few details about the kitchen sink project, in case you’re interested . . . The laminate countertop came from Menards. They were the only place we could find a 12′ length without having to special-order it. The color is called Ivory Kashmire. It cost $66, well under what I thought I’d have to pay! I chose it because I liked the square edge. Otherwise, I might have chosen the brown one. So there’s how I make decisions — haha! The faucet came from Quinn Lumber Co. in Marceline, MO. It’s by Mintcraft, and cost $84. Can you believe the faucet cost more than the countertop? And I won’t even know what to do with the spray hose, I haven’t had one for so long — I’ll just keep forgetting it’s there! I had thought about getting a new, deeper sink, but the countertops are built a little bit lower than standard. When the cabinets were built, the lady of the house was a petite little thing, and requested that the counters be positioned at the right height for her (and why not?). 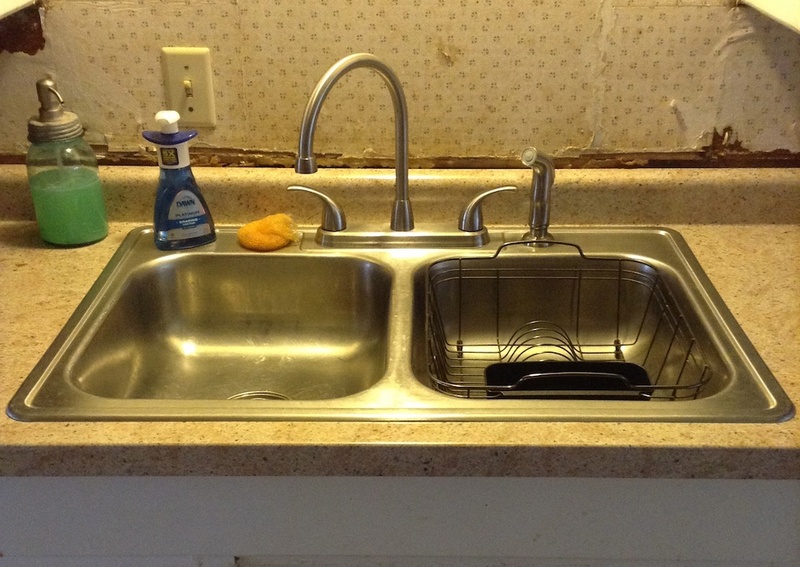 So I decided to keep the existing stainless steel sink instead of getting a deeper one that would go lower. We just replaced the old rusty baskets, and it’s all new now! I’ve picked out backsplash, but just need to make a trip to town to get it. I can hardly wait! I can’t tell you what the project as a whole cost, because we have been collecting pieces and parts for every project ever since we moved in, and whenever we tear out something, we re-use pieces in other places — recycling and re-using whatever we can. I will tell you that none of our projects to date has cost very much, and that is a very good thing, because we still have a long way to go! You are a strong, patient woman. I am glad all is working out for you, Shelly. Missed you at guild! Yay!!!! I know how happy this will make you!!! Bout’ time!! You have the patience of Job! I would have resorted to bodily harm against the handiest member of the male species long before Calvin showed up. I won’t recognize your place next time I come by. ..glad you found Calvin! When you are finished with Calvin, can you send him to me?? This old farm house has a few needs!!! 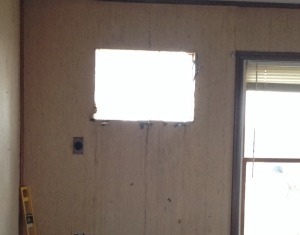 I’m so glad for you that your house project is making progress. Everyone wants you to be quilting. I completely understand what you are saying. We’ve been trying to get a bathroom in upstairs for over a year now. Everything depended on the carpenter who is the great procrastinator. He took a lot of other jobs while he made us wait. 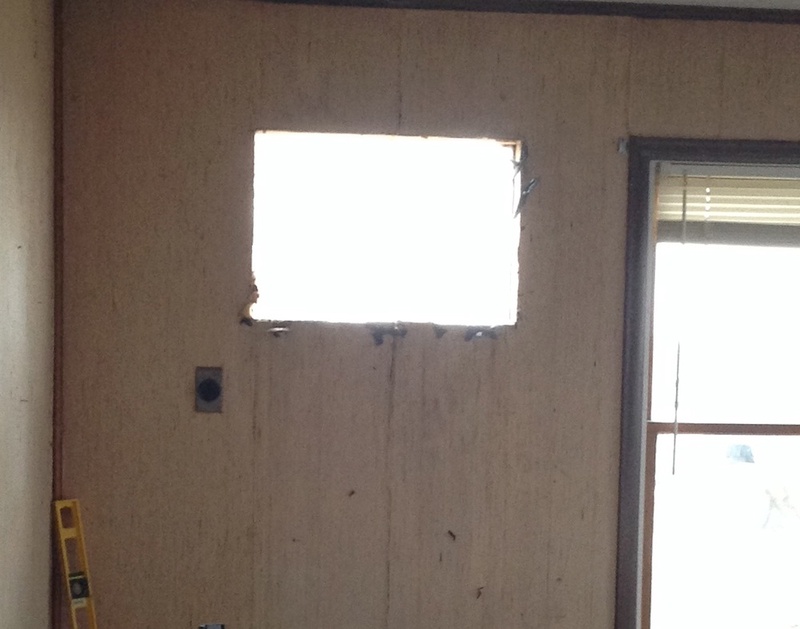 We needed to have it finished so our daughter could have a bathroom upstairs. This was important as she was having hip surgery Nov.7th. Well I got kind of upset seeing it was Nov.2nd and still no bathroom. To make a long story shorter the bathroom was finished Nov.6th. Still the tub needs to be hooked up, but the missing part will be in Monday and the plumber will be here Tuesday at 8:30 to install it. Yes he will show up. He is a friend and fellow church member. Thank the Lord the bathroom will be gorgeous. Marble floor, Fishbowl sink and a Slipper tub. And a beautiful window to look out over the woods outback to see the deer walk by at sunset. 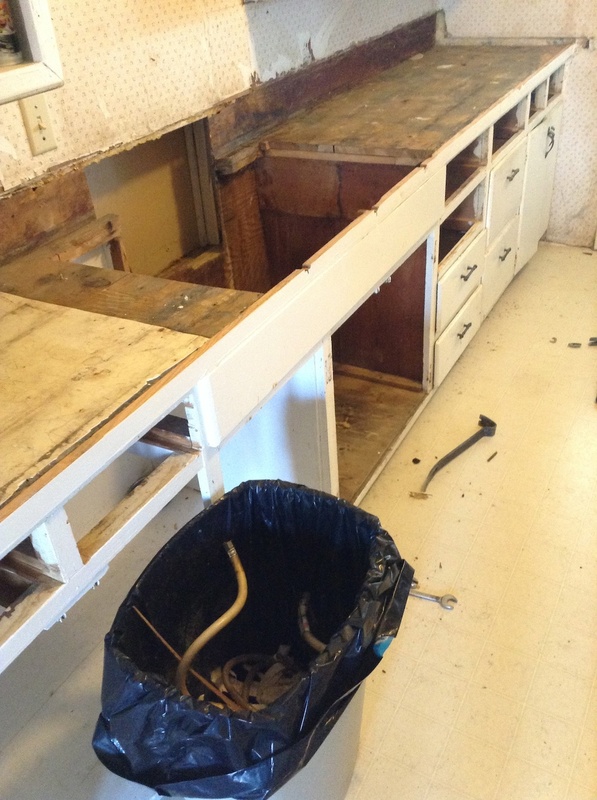 Did you find it at all scary to see what was under that countertop? =) I’m afraid to look at mine! I have to say that hearing about your kitchen made me appreciate mine, and it needs new cabinets and counter top! What interests me is what Calvin-the-angel charges. =) I’m so glad you have hot and cold running water again! I’m thinking that I love Calvin, too. This kind of guy could find romance lots of places……..if he were that kind of guy! !